The digi I've used to create this card, "Waddles" is available from the Creative Bug Digital Snapshots store, where you'll find a LOT of amazing digis, all designed by my sweet friend, Naomi, from Creative Bug on the Loose. Naomi and I have known one another for a couple years now, but this is the very first card I've created using one of her creations, so it's about dang time! I colored Waddles with markers then fussy cut him. 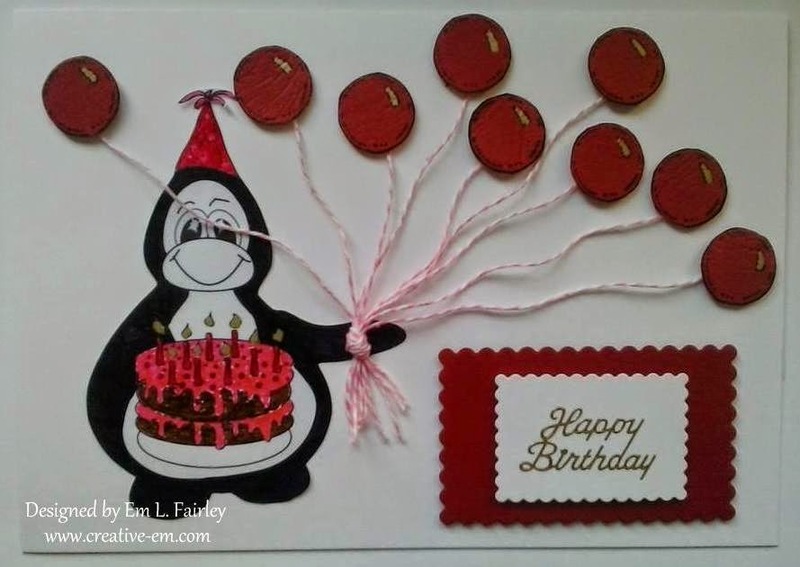 The balloons were stamped onto some textured red card then cut out, I've used nine because that's how many candles are on the cake that the adorable penguin is holding. I gave them some dimension by popping them up on foam pads, which hides the end of the twine. The design has been completed with a die cut sentiment panel and peel off sentiment. Naomi, I REALLY hope I've done your little guy and creative talent, justice! Hi Em, a fabulous card, just love the image. Your card is so so super cute I love all the balloons and the frosting on the cake looks Yummy. you definitely did Naomi's digi justice!!! Waddles is great and your card is great also. Thanks for joining in at CFTH. Oh wow, Em. Waddles looks fabulous and I just love all the balloons. What a wonderful birthday card. Thank you so much for entering our current Creative Bug Digital SnapShots Challenge. Good luck in the draw and I hope that we'll see you enter a future challenge as well! That's an awesome b-day card! Totally love all the great balloons you have added! Thanks for joining us at Creative Bug Digital SnapShots Challenge for our monthly challenge DT Crafting Vicky. Fabulous b-day card!!! Totally love all the great balloons you have added to this!! !